For a long time, my favorite program for Android was Locale. 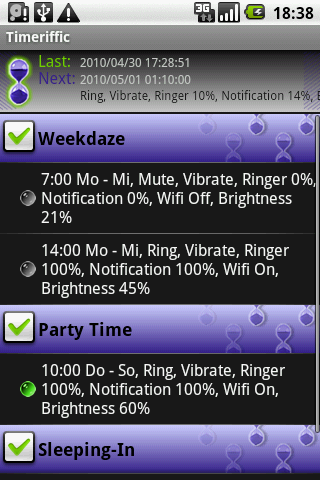 This app made it possible for me to set up profiles linked to the time of day and my location. 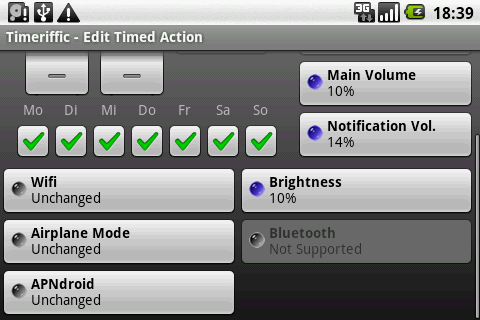 So when I drove to work in the morning, my phone’s sound settings were normal, and Bluetooth and WLAN were switched off. Locale then switched my profile, so that once I was at the office the settings turned silent, and Bluetooth and WLAN were switched on. The app costs $9,99 nowadays, and because that’s a bit too pricey for me I started looking into possible alternatives, which is how I came across Timeriffic. What does Timeriffic have to offer and can it replace Locale? Today’s test review was written by Kevin Taron. At first glance, Timeriffic comes across as somewhat confusing. Once you’ve spent a bit of time trying to get the hang of it, you figure out which functions Timeriffic has to offer, though. 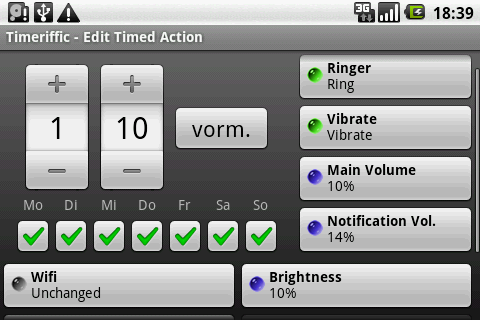 So, for instance, you could set up a profile that switches your phone to silent, switches WLAN off, etc. every morning before work, and as soon as you finish work everything is switched back on. Once you’ve chosen which other profiles you need (flight mode on at night and off when you wake up in the morning, and so on), you can set them up according to your preferences so that you won’t have to do anything manually any longer. No more embarrassing interruptions by callers during meeting, just because you forgot to change your profile. There are still a few options missing from the profile configuration details: there’s no display timeout, lock screen, or Bluetooth (mentioned above). Also, it isn’t possible to select profiles manually, so that you can use the set up whenever you like, and not just at the designated time. And there’s no Widget, either. Timeriffic is alright, and to a certain extent it does live up what it’s meant to be able to provide. And although it works fine, I’m still missing a few things. I can’t help but compare it to Locale, and unfortunately Timeriffic just can’t compete with it. Too bad! The entire app is a bit too busy with graphics and colorful text blurbs. I had to get used to the app’s design, but once I did I found that it pretty much does what it’s meant to. You’ll find a display in the upper margin that lets you know when the last changes were made, as well as when the next action will be taken (the details of the action are also shown). Profiles and action set-ups are next. There you’ll find an overview of different profiles and the action details. It isn’t possible to shift around action details amongst the different profiles, unfortunately. Controls are relatively simple. To change an action all you need to do is click on it; to delete it you have to press on it for a longer time. You can rename or delete profiles by clicking on them for a long time. Timeriffic didn’t crash during the testing phase. No problems to report—all the actions were carried out at the correct times. Timeriffic can be downloaded for free from the Android Market. Now it's free, but I do not really understand what can be useful. @justJay: Good to hear some positive feedback! Overall a pretty good app.. 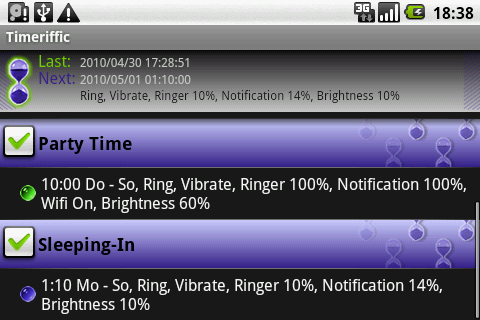 I use it to auto sleep ring and auto dim my Eris at night then return to normal in the morning.. also I have a weekly meeting I attend for a hour.. and its set to vibrate only for that hour. I don't care how it looks... once setup.. you never really need to look at it any way. looks a bit of a mess. i agree with the overall low rating. the app really needs to improve on its looks.